Oskar Kovač graduated from the Faculty of Economics University of Belgrade. He was awarded MSc and then PhD in 1971. He was a postgraduate research student at the London School of Economics and Political Science with the OECD scholarship. He spent the academic year of 1979-1980 at Massachusetts Institute of Technology, the USA with the fellowship of American Association of Learned Societies. Oskar Kovač was the Head of the Department in the Republic Planning Office of Serbia, Belgrade and research-fellow and Head of the department of Institute of Economic Sciences in Belgrade until 1972. 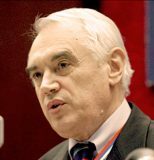 At the same year he was awarded the title of assistant professor, in 1978 the title of associate professor and in 1984 he was awarded full professor at the Faculty of Economics, University of Belgrade. He was the Dean of the same faculty, Head of the Department for International Economics, and the President of the Doctorate Committee. From May 1986 to March 1989 he was a member of the Federal Executive Council of Yugoslavia and in 1992 Deputy Prime Minister of Yugoslavia. Professor Kovač was a visiting lecturer at the Economic Institute of Hungarian Academy of Science, American Association of Slavic Studies, New York Council of Foreign Relations, the EU Conference in Bangkok, International Work Organization in Geneva, University of Seoul, Universities of Hamburg and Munich, The Centre for the Third World Studies in Mexico, Central European Studies in Prague, World Bank and OECD. His fields are the theory and policy of international economics and finance, world economy and economic development. At the Faculty of International Economics of Megatrend University he teaches: Economy of the World Regions, Economics of Banking and Finance, International Economics, Theory and Policy. Professor Kovač is the member of the Scientific Society of Serbia, full-time member of the Serbian Academy of Economic Sciences and the board member of Economic Sciences of Serbian Academy of Science. Fluent in Hungarian, English and German.